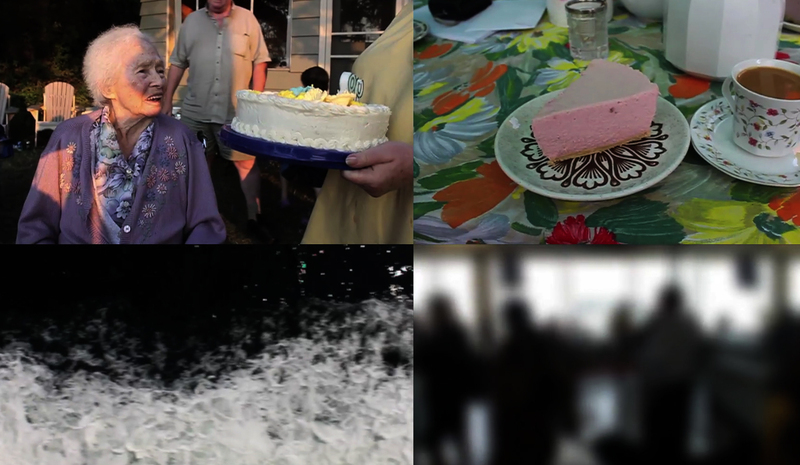 The video is a four-screen cultural comparison of two birthday parties: one on Vancouver Island, Canada (left), the other in Friesland, The Netherlands (right). The top two screens play forward while the bottom two screens play in reverse. The video reflects on notions of family, loss, identity and memory. This project came up naturally. I am Canadian and I'm married to a Dutch woman. We attended each other's family birthdays in Canada and the Netherlands. The Canadian birthday was busy, a bit chaotic, loud and colourful, set near a beach on Vancouver Island. The Dutch birthday was held outdoors in Friesland under a vinyl tent serving quark tart. They were simply different. I was curious in contrasting the cultural differences of the two families. The video reflects the experience of travel, arriving and celebration for both events. There was also the inevitable leaving and saying goodbye. This coming and going is mirrored with the video playing forward on the top and in reverse on the bottom - Vice Versa. The clips have been carefully edited to juxtapose various images against one another. The audio from the four screens is mixed with "Hawaiian" style popular music from the 1940s. The music is public domain.